But Russia also signaled it may be willing to give some ground, with a senior Kremlin official telling Trump's national security advisor that Russia was ready to address U.S. concerns about how the 1987 Intermediate-Range Nuclear Forces Treaty was being implemented. Trump drew a warning of "military-technical" retaliation from Moscow after saying on Saturday that Washington would withdraw from the Cold War-era pact which rid Europe of land-based nuclear missiles. Signed by then-President Ronald Reagan and reformist Soviet leader Mikhail Gorbachev in 1987 at a time of unprecedented East-West detente, the INF treaty required the elimination of all short-range and intermediate-range land-based nuclear and conventional missiles held by both countries in Europe. Its demise could raise the prospect of a renewed arms race, and Gorbachev, now a frail 87-year-old, has warned that unraveling it could have catastrophic consequences. Kremlin spokesman Dmitry Peskov on Monday called Trump's withdrawal plan a matter of deep concern for Moscow. "Such measures can make the world more dangerous," he said during a daily conference call with reporters. Peskov said President Vladimir Putin had repeatedly warned that the demise of the treaty would force Moscow to take specific military steps to protect its own security. "Scrapping the provisions of the INF treaty forces Russia to take measures for its own security because what does scrapping the INF treaty mean?," said Peskov. Trump's national security adviser, John Bolton, on a visit to Moscow, had talks with Nikolai Patrushev, the Secretary of Russia's Security Council. In a statement issued afterwards via Russia's TASS news agency, the Security Council said Patrushev had emphasized Russia's view that the INF treaty should be retained, and tearing it up would undermine international arms control. "The Russian side ... confirmed their readiness to work jointly in the interests of removing mutual grievances about the implementation of the agreement," the statement said. Bolton was due to meet Foreign Minister Sergei Lavrov later on Monday, and to see Putin on Tuesday. Peskov said Trump's decision to quit the pact would be a subject for discussion with Bolton, and that Moscow was looking for a detailed explanation as to why Washington had decided to turn its back on the treaty. The INF treaty required the United States and the Soviet Union to forego all nuclear ground-launched ballistic and cruise missiles with a range of 500 to 5,500 km, eliminating an entire category of weapon. The Soviet Union scrapped hundreds of SS-20 ballistic missiles armed with nuclear warheads which had a range of 5,500 km, as a result. Many of them had been pointed at Europe. NATO's decision to station Cruise and Pershing nuclear missiles in Europe provoked waves of protests in the 1980s from anti-nuclear campaigners who felt their deployment would turn Europe into a potential nuclear battlefield. The 28-member European Union called the INF treaty "a pillar of European security architecture" which had resulted in the destruction of almost 3,000 nuclear and conventional warheads and continued to play an important non-proliferation role. "The United States and the Russian Federation need to remain engaged in constructive dialog to preserve the INF Treaty," Maja Kocijancic, the bloc's spokeswoman for foreign affairs and security policy, said in a statement. "The world doesn't need a new arms race." French President Emmanuel Macron spoke to Trump on Sunday to stress the importance of the treaty, his office said on Monday. The German government said it regretted Trump's decision, saying NATO would now have to discuss the development. China also condemned Trump's move on Monday, saying it was wrong to unilaterally pull out of the treaty. In Moscow, Peskov said there was a six-month period for Washington to withdraw from the INF treaty once it had given official notification it was leaving, something he noted it had not yet done. That meant the question of Russia acting to restore the military balance between Washington and Moscow was not "for today or tomorrow," he said. 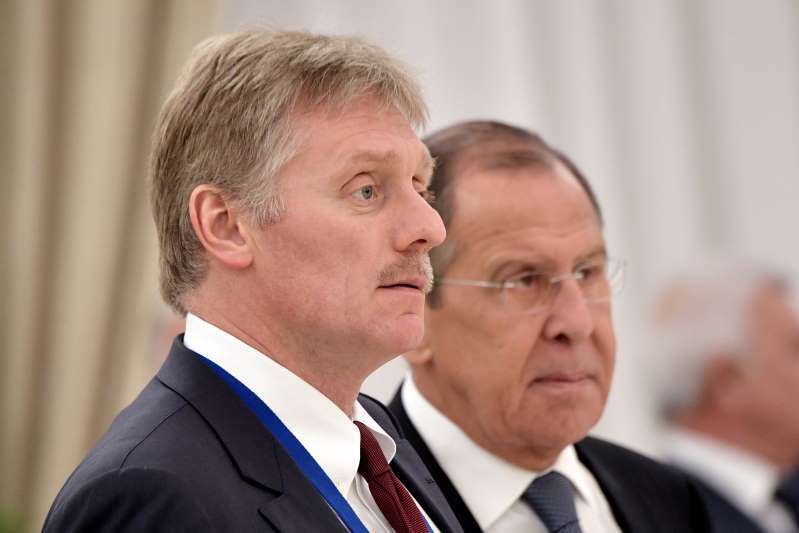 Peskov denied U.S. accusations Russia had breached the treaty, alleging that the United States was the one at fault and had been steadily undermining it. "Putin has said many times that the United States de facto is taking measures that are eroding the conditions of this treaty," said Peskov, referring to strike drones and anti-missile systems capable of destroying short- and intermediate-range rockets.